There’s your comfort food. And there’s your comfort zone. Comfort food is instilled in your childhood. A summer potato salad from your mom. A grandmother’s latkas you smell on the stairway of her apartment building before you’ve even knocked on the door. The personal mixture of memories and flavors is exceptional for each of us. That comfort zone is something else. For many, it’s more an uncomfortable zone. Most of us grew up on one or two cuisines, before there was a Whole Foods a couple of blocks away or a nearby megamart with aisles and aisles of foods from around the world. For me, with a career in food now, I’ve been fortunate to have wonderful friends with great skills and recipe portfolios. They have taught me and encouraged me, so I’m a good world cook. As long as “the world” is American, Southwestern, Italian and French. Beyond that, I get a little nervous. I do try to get my clients at Cooking by the Book to have events featuring other cuisines, say Thai or Chinese, but when people plan a party they get pretty conservative. Chicken is safe. Baked chicken with barbeque sauce is safer. Getting people to eat lamb is harder than giving a root canal with no anesthesia. Getting people to cook Indian food is just not easy. In truth, getting me to cook Indian is not easy. It’s been out of my comfort zone. Enter Madhur Jaffrey. A world-class culinary figure, Madhur has authored many cookbooks — six of them James Beard Award winners. Her recipes are authentic, wonderful, and enticing. Her newest book, At Home with Madhur Jaffrey, arrived on my desk last week, and I was instantly captivated. The recipes look so good, so easy to do, and so different, that I did what I rarely do: I bought lamb. I made this dish and I felt proud. I’m a modest cook and I believe I cook well but I’m also my own toughest critic. For me to smile and tell myself that I just did some with excellence, well, that is rare. This dish is that rare. Except I think At Home with Madhur Jaffrey is filled with other dishes that are going to equally wonderful. I’ll be testing and reporting more to you. I made this dish with her coconut rice and that will be my next post here. At Home with Madhur Jaffrey is sure to expand our culinary horizons. There just may be some comfort food here! 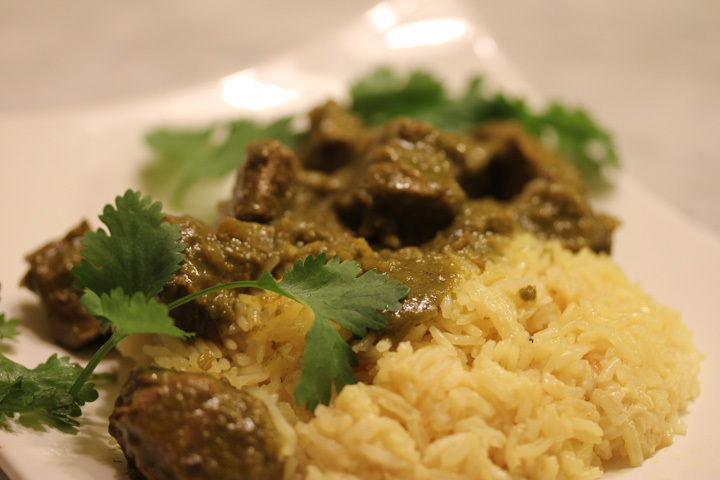 This dish is from Western India and can be made with either lamb or chicken. It is cilantro-intense. Really intense. But that just means you have lovely deep color and flavor. Try this dish and you, too, will be smiling and proud. Put the lemon juice ½ cup water, chopped cilantro, ginger, garlic, chilies, turmeric, and salt in this order, into a blender. Blend thoroughly, scraping down the sides, if necessary, with a rubber spatula, until you have a fine paste. Add the green sauce from the blender and bring to a simmer. Cover and place the pan in the oven. Bake for 60-75 minutes, then test to see if the meat is tender. If not, return the oven for 15 minutes. Take the pan out of the oven and add the coconut milk. Stir it in. Reheat gently just before serving.